Each and every single year, thousands of us, if not millions of us set our new year resolutions around this time of year, in hope of making changes for the new year approaching. I will admit to making resolutions, but without fail, every single year, if I don't fail all of them, I fail at least most of them! One year I didn't fail my resolution was promising to find myself, and that I did, and years on, I'm proud to know who I am, and what I do and don't need in my life! When we got a puppy in March this year for Spud's ninth birthday, I wasn't quite sure how life would be when I become a pet owner, now I know though that Jezeppi is apart of the family, he's not a pet, but indeed a family member. Jezeppi is like a second son to me, and a little brother to Spud, their bond is the cutest and unbreakable to say the least! With this time of year approaching, the family have been discussing their new year resolutions, and this got me thinking of Jezeppi, and what his resolution would be if he could talk? Would it be to stop chewing anything that isn't his? Or eating food that's not his, or food he isn't suppose to have (when we leave the room for 30 seconds, Jezeppi thinks its his! ), or would it be to not rip and destroy every toy he gets, so he can actually play more, rather than destroy the toy and be bored after? Who knows! Talking about #AnimalResolutions, this year, Discount Supplements have suggested some of the resolutions our most loved animals (past and present) would possibly choose for 2016, and here they're! 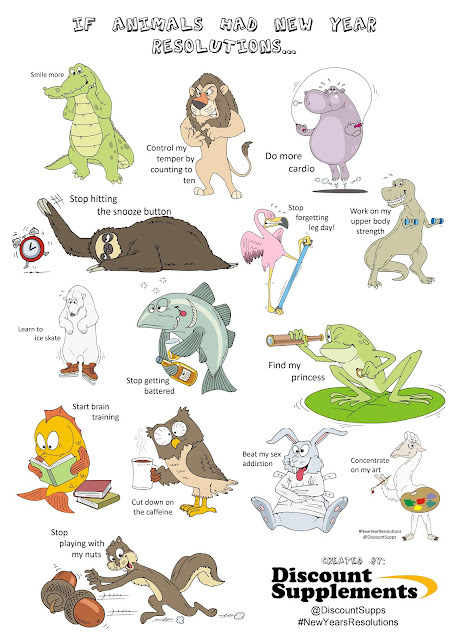 Its a very funny visual, and I'm sure they'll be lots of adults copying some of these resolutions for their own resolutions - we'll call them ones Human Resolutions! Me and Gareth also come up with a few which we thought were quite funny! Skunk: To start using deodorant. Elephant: To start a diet! Kangaroo: To make my child walk. Cat: Stop going through people's rubbish. Have you tried coming up with some yourself? 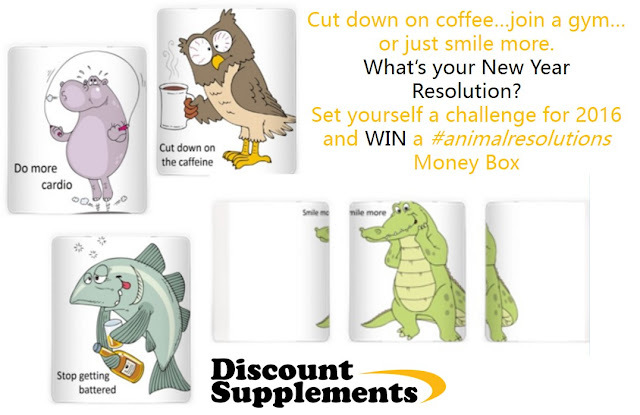 If not, don't worry, you can still get your hands on a #AnimalResolution money box, the prize is supplied by gold standard whey providers Discount Supplements, to get you in the new year resolutions mood! Enter the competition via the Rafflecopter form below and get thinking of them resolutions!